Additional information on Egypt on energypedia. The Arab Republic of Egypt is located in North Africa and borders with Libya in the West, Sudan in the South and Palestinian territories and Israel in the East, while in the North, it is washed by the Mediterranean. Its population is mainly concentrated along the river Nile, as the rest of the country's territory is largely desert. Most parts of the country have a hot desert climate with extreme heat occurring during summer. An exception is the northern Mediterranean coast which receives more rainfall during winter and has a generally more moderate climate. Egypty is a country with a high potential of natural resources: precious stones, natural gas, oil, coal and large reserves of fossil fuel enery sources; approximately 4189 billion barrels of oil reserves and an estimated 77200 billion cubic meters of natural gas resreves, as the reserves are in the form of both mainland and coastal deposits. 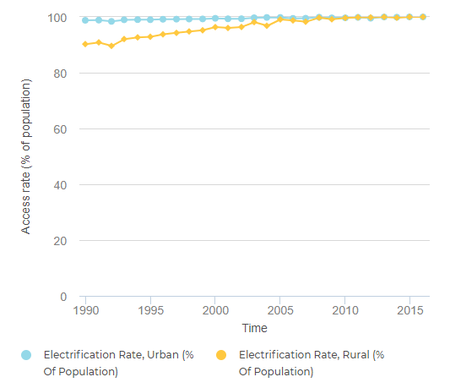 While more than 90% of the Egyptian generated electricity comes only from oil and natural gas, the major problem that Egypt encounters, especially in the energy-sector is the dynamic growth of population, which is estimated by around 1.3% per year, consequently increasing demand, which eventually fastens the rate of depleting the country's major resources. According to the US Energy Information Administration (EIA), it is the largest non-OPEC oil producer in Africa and the third largest dry natural gas producer on the continent, following Algeria & Nigeria. The country also represents a vital role-player in the international energy market, as a major transit route, by operating the Suez Canal and the Suez Mediterranean Pipleline (SUMED), through which the oil is shipped from the Persian Gulf to Europe and the United States. Egypt has been known to mainly depend, in all its energy-related activities, on three major sources: oil, natural gas and the hydroelectric power generated from the large dam projects over the Nile: the High Dam, Aswan I & Aswan II. Despite being a major producer and net exporter of oil, especially in the 1990s, when its oil production peaked, reaching approximately over 900000 bbl/day, Egypt has become a net oil importer around 2009/2010. Thus can be traced back to both economic and population accelerated growth, which accompanied the beginning of the new millennium, leading to an increase in consumption by about 3% per year, resulting in growing of demand, and falling in production, that could roughly meet consumption requirements, resulting in a significant drop in the country’s oil refinery output since 2009. During the period of the late 1990s/early 2000s, Egypt has witnessed a state of proliferation of discovering and exploiting huge natural gas reserves around the country, which drove the country to emerge as a key role player in the region as a natural gas producer and exporter. Mainly, due to the same reason as in oil, consumption of natural gas has approximately increased by 7% per year during the first decade of 2000s, and production has noticeably decreased by around 3% yearly during the period of 2009-2013, consequently limiting its natural gas exporting capacity to only 5% of its total production by 2013, and eventually driving the country to start signing importing agreements in the following years of 2014 and 2015. According to reports from American Security Project (ASP) and United Nations Environment Program (UNEP), Egypt has produced approximately 13.2-13.7 billion kilowatt-hours (KWh) of electricity, using hydropower in the period 2012/2013. Hydropower accounts for about 9% of the total country’s power generation, and around 3% of the country’s total energy consumption, however, the majority of the Nile hydropower’s capacity in Egypt has already been exploited and is declining. 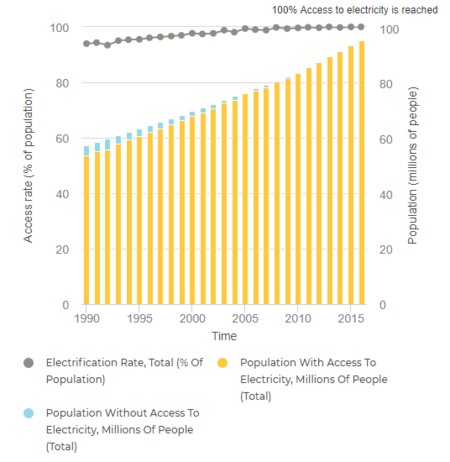 The report shows that since around 2014/2015, the total Egyptian population has had access to reliable energy sources, and only 2% of the whole population has no access to clean cooking. With accordance to the EIA's report on Egypt (2018), the following graph and pie-chart highlight the installed capacity of different energ sources in the country from 2007-2016 in terms of fiscal years. Egypt is by far the largest consumer of oil and natural gas in Africa, showing 22% of petroleum and other liquids of the continent's total consumption and 37% of its dry natural gas consumption. Intense extraction projects of oil and natural gas. The inclining rate of private and commercial vehicle sales. The generous subsidy policy, that is focused on energy products. Through this sub-chapter, different consumption data will be presented, using different sources, to get a holistic view as possible of the energy consumption situation in the country. 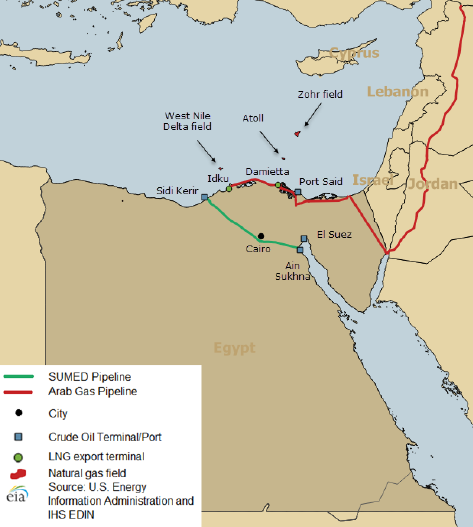 Egypt is a net exporter of crude oil and natural gas, however, the combination of increasing consumption and declining production has led to a decline in natural gas exports since 2009, as the government started to divert natural gas supplies from exports, in order to satisfy domestic demand, eventually turning the country into a natural gas importer since 2015. In terms of coal and peat, Egypt is a net importer, and coal imports are even expected to increase in the short-medium term, since the Egyptian government has approved the industrial use of coal in April 2014, and in the same year signed a construction deal for the first coal-fired power in the country. In 2013, the Egyptian government spent 120 billion Egyptian pounds (about 13.8 billion EUR) on fuel subsidies, which equals 7% of the GDP. These costs in combination with economic stagnation have contributed to the increasing deficit, which reached about 12% of GDP in 2013. In order to alleviate this burden, the Egyptian government announced spending cuts on energy subsidies in June 2014. The Financial Times reported that these subsidies are going to be cut by almost a third . According to the U.S. Central Intelligence Agency (CIA)'s 2018 report, only around 300,000 people of the whole Egyptian population is currently without access to electricity. Between 2011/2012 and 2012/2013, the total installed capacity increased about 6 %, reaching 30,803 MW, due to added thermal plants. 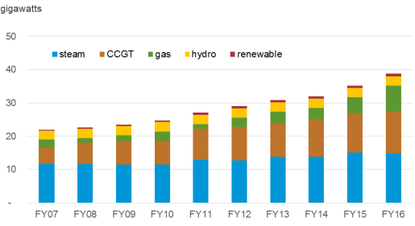 The installed capacity development by type of generation since 2008 is outlined in table 12. In addition, Egypt has 30 decentralized power plants, mostly diesel and gas turbine units which are not connected to the national grid. The combined installed capacities of these plants added up to 224 MW in 2012/2013. Approximately 234.5 GWh of electricity were supplied to local users including tourist resorts. Egypt is a net exporter of electricity, importing 77 GWh while exporting 474 GWh of electricity in 2012. 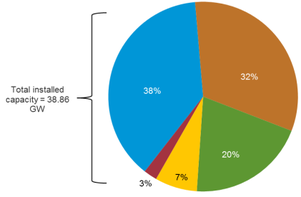 In 2012/2013, the average percentage of network losses were 11.02%. Between 2001 and 2012, electricity production rose from 83,282 GWh to 164,364 GWh. 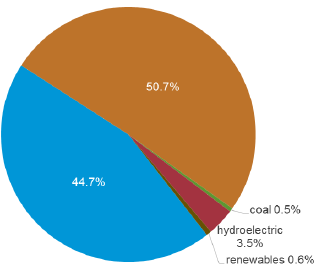 The main source for the production of electricity is gas (66%) followed by hydro (18.2%) and oil (15.6%). The Egyptian Electricity Holding Company (EEHC) operates with five-year plans. The current one (2012-2017) foresees the installation of 15.000 MW additional capacity. However, due to the increasing demand, the reserve margin is still expected to remain tight. The main consumer of electricity in Egypt is the residential sector which accounts for 42% of the total consumption, followed by the industrial sector (28%). The consumption of the residential sector has been steadily increasing in the recent years. According to the Ministry of Electricity and Energy, this is due to two factors: the expansion of residential compounds and new communities as well as the use of domestic appliances, air conditioners in particular, during hot weather. The development of the electricity consumption per sector is outlined in table 13. In 2012/2013, the carrier grid consisted of 43,634 km total transmission lines and cables. The grid is subdivided into six geographical zones, namely Cairo, Canal, Delta, Alexandria and West Delta, Middle Egypt and Upper Egypt. The country’s entire territory is covered. The network is interconnected with the grids of Libya, Jordan, Syria, and Lebanon. There are ongoing studies for interconnections with Saudi Arabia, Sudan, the Democratic Republic of Congo, the Eastern Nile Basin (Sudan and Ethiopia) and Greece. The prices of electricity in Egypt range among the lowest in the world. The prices are fixed by the Egyptian and are highly subsidized. The tariff structure varies according to the type of consumption (i.e. residential, commercial, industrial) and amount consumed. Since the tariff is higher for higher consumption, there is an incentive to consume less. The lowest category of the residential tariff, up to 50 KWh/month, has remained unchanged since 1993 at 5 piasters (approximately 0.6 €-ct) per KWh. Since 2007, the government has been trying to cut costs for subsidies. In July 2014, electricity prices were increased as part of a five-year plan which aims to start generating profits from electricity, which is currently sold for less than half its production cost. Despite the lack of profound resources and information, and the ambiguity of available data regarding energy security in Egypt, yet Atlam & Rapiea (2016)’s study on “Assessing the Future Energy Security in Egypt” can be used as a firm basis for investigating the energy security situation in the country.. In 2012, electricity production from renewable energy sources reached 14,855 GWh, which is a share of 9.04% of the total electricity production. While 13,358 GWh (8.13%) were produced by hydropower installations, wind power contributed another 1,260 GWh (0.77%) and solar PV 237 GWh (0.14%). The latest estimates of the hydropower installed capacity are approximately 2842 MW, accounting for about 7.2-9% of the total generated mix. Also, the ongoing implementation of 32 MW hydropower project in Assiut governorate and a 2400 MW pumping and storage plant in Attaqa-Suez, that is supposed to be operating by 2022, according to the Egyptian Ministry of Electricity and Renewable Energy & the Egyptian Holding Electricity Company. Egypt is endowed with abundant wind energy resources, with many coastal regions, where high and stable wind speeds are frequent, especially in the Gulf of Suez and the Nile Valley, as wind speed could reach 10.5 m/s at 50m height. Though solar energy use in the country is still in its infancy, yet the country has a great potential in the solar sector. With accordance to the EIA's latest report, the country only has 30 MW of installed solar capacity so far. Additionally, there is one solar thermal project, an integrated solar combined-cycle power plant. Here, the solar power partially replaces fossil fuel. The plant has an overall capacity of 140 MW, of which the solar input is 20 MW. More PV projects are in the pipeline, one in Hurghada (20 MW, expected start of operation 2016), and one in Kom Ombo (20 MW, expected the start of operation 2016). Also, the Egyptian government has a huge scheme to boost the solar sector by installing a 1.8 GW solar park, which to be developed in Benban. As part of reaching that goal, the Egyptian government has closed two deals on two different fronts; the 1st is with Norway's Scatec Solar to build six solar photovoltaic plants with a combined capacity of 400 MW, while the 2nd is with Saudi firma Acwa for another three solar photovoltaic plants with a capacity of 120 MW. The decline of Egyptian oil and natural gas reserves; as proved oil reserves have decreased from 4.5 million barrels in 2009 to 4.2 million barrels in 2013, while natural gas reserves have decreased from 78 trillion cubic feet in 2010 to 77.2 trillion cubic feet in 2014. The fact that the current Egyptian energy mixture is not properly diversified, as Egypt, heavily and mainly depends on oil, natural gas and the hydroelectric power from the Nile, with the third being close to nothing and even descending more, then Egypt is left with only both oil and natural gas representing approximately 90.4-94.4% of the total primary energy consumption till 2014. The gap between supply and demand of oil, since the supply ratio is about 52.7% of the demand. The majority of the Egyptian imported oil (~4.9 million tons), comes only from three suppliers: Kuwait, Iraq and Oman –according to the Egyptian Ministry of Petroleum- in 2014. Such a low variety of oil importers increases the probability of the risk of Egypt being negatively affected by any geopolitical instabilities in one or all of these importers, consequently affecting its ability to secure domestic demands in such situations. The low percentage of private investment in the energy sector (~16% in 2014/15), which in a way confines and hinders the technological aspects of energy production, distribution and consumption. The aging, un-maintained, low to non-efficient, mal-planned Egyptian infrastructure, especially in the energy sectors, which when faced with any sign of major problem, would lead to catastrophic outcomes, as for example, the daily blackouts of 2013 and 2014 summers, where electricity used to be completely absent allover Egypt for 6-8 hours/day through different times of the day. The non-existence of clear, to the point and profound strategies to be properly integrated in the Egyptian energy sector, and the un-clarity and complete randomness of the existent mixed ones, which are mostly unreliable, un-applicable strategies designed by totally different and varied institutions and energy-suppliers with different agendas and mentalities, eventually hindering any possible appropriate application or planning a proper solution(s) to secure energy supply. The combination of increasing demand, decreasing production and high subsidies for fuel have put a strain on the Egyptian energy sector and led to an enormous public deficit. As of June 2014, Egypt owed 7.5 billion USD and counting to foreign oil and gas companies alone . In order help meeting the energy demand and to prevent an Egyptian energy crisis, Gulf countries have been providing financial aid to Egypt. However, this kind of aid is expected to decrease as the Gulf countries are impacted by the falling oil prices of 2015. One topic dominating energy policy debates in Egypt is the use of coal. In April 2014, the government approved the industrial use of coal. This is especially relevant for cement factories, as these are particularly energy intensive and have occasionally been cut off from the energy supply as the government's priority was to preserve gas for power generation. Phase 1 will adopt competitive bids through issuing tenders requesting the private sector to supply electricity from renewable energy sources. In Phase 2, a feed-in-tariff will be implemented, in particular for medium and small size projects. Phase 3 allows investors to build and operate renewable energy power plants to satisfy their electricity needs or to sell electricity to other consumers through the national grid. Also, an RE support fund is supposed to be established to cover the feed-in tariff payments. In September 2014, the government approved the issuance of feed-in tariffs for solar PV and wind projects. The new Presidential Decree 1947/2014 of October 2014 provides for fixed feed-in-tariffs over 25 years for PV and over 20 years for wind. These tariffs will be adjusted as soon as the following ceilings are reached: 300 MW of small PV (< 500 kW), 2000 MW of medium PV (500 kW – 50 MW), and 2000 MW of wind. The tariffs are going to be paid according to plant capacity. The details are outlined in a guiding document published by the Egyptian Electric Utility for Consumer Protection and Regulatory Agency (EgyptERA). The FIT scheme is complemented by Law 203/2014 of 22 December 2014 whereby the Egyptian TSO (EETC) and the local distribution companies are obliged to connect a RES project to the grid. The costs of the connection shall be borne by the producer, while the government shall fund any extension of the grid. They are also obliged to purchase the electricity generated by qualifying projects and, if this is not feasible, compensate the producer. Egypt has adopted a National Energy Efficiency Action Plan (NEEAP) (2012-2015) with cumulative energy efficiency targets of 5%. At the Council of Minister's secretariat, there is an EE unit which is the mandated entity for developing and implementing this plan. However, there is no designated energy efficiency agency and no general legal framework for EE measures. Mandatory EE codes for residential buildings (2006), commercial buildings (2009), and government buildings (2011) have been adopted. Minimum performance standards with mandatory labeling schemes have been adopted for refrigerators, freezers, washing machines, air conditioners, CFLs, and electric water heaters. By 2012, 750,000 m2 of Solar Water Heaters had been installed and 10.25 million Compact Fluorescent Lamps (CFLs) had been distributed. However, there are no buildings which are built according to EE building code and no demonstration projects for energy-efficient buildings. Coordinates, supervises and monitors the activities of its affiliated companies in the fields of production, transmission and distribution of electric energy. Responsible for the country-wide transmission of electricity to regional and local distributors. The current Egyptian electricity market is completely composed of governmental owned utilities, which can be divided into: 6 for generation, 1 for transmission and 9 for distribution, which all are operating under the direct management of the EEHC, as shown in the following figure (Fig.20). On the other hand, the whole petroleum sector in Egypt is run by main five state-owned enterprises, with accordance to the latest EIA's Egypt's analysis brief (2018), which can be summarized in the following table. In the area of fossil power plants, Egypt already works with Independent Power Producers (IPPs). The first contract under a power purchase agreement (PPA) was signed in 1998.In 2012/13, the following IPPs feed a total 33 GWh into the Egyptian electricity grid: Petrochemicals (15 GWh), Carbon Black (1 GWh), Talkha Fertilizerand Ghazl El-Mahaala (17 GWh). The private sector is also involved via the “Build-Own-Operate-Transfer” (BOOT) scheme. Four steam power plants were operated with the BOOT model in 2012/13 and provided a total of 14,264 GWh. According to EgyptERA, the companies under the BOOT model are Suez Gulf Power Company (4,576 GWh), Port Said East Power Company (4,983 GWh) and Sidi Krir Generating Company (4,705 GWh). The power plants operated by these companies were built in 2001-2003, with an installed capacity of 682.5 MW each. All three BOOT companies were acquired by the Malaysian Powertek Energy in 2006/2007. The Egyptian Wind Energy Association (EGWEA) is the umbrella organisation, representing the wind energy sector in Egypt. It assists interaction and co-operation between all relevant players with professional involvement in the field of wind energy. The EGWEA is organised in a global network of wind associations. It aims at promoting and supporting the development of wind energy in Egypt by providing the means to facilitate the exchange of technical information, expertise and experience in the wind energy sector. It conducts studies, provides information on tenders and conferences and organises workshops for interested parties. EGWEA is particularly interested in bringing forward wind energy interests of Egypt. However, the association is also engaged in the promotion of wind energy in developing countries in general. At the European level, a Memorandum of Understanding to enhance EU-Egypt energy cooperation was signed in December 2008. The priority areas covered are, among others, the development of the Egyptian energy strategy, including the market reform, the convergence of Egypt’s energy market with that of the EU, the promotion of renewable energy and energy efficiency, the development of energy grids as well as technological and industrial cooperation. Along with the World Bank, the African Development Bank, the United States, France, the EU and Japan, Germany is Egypt’s leading partner in terms of official development assistance. Egypt is one of the priority partner countries of the German development policy. Since 1963, Egypt has received approximately 6 billion EUR of aggregate commitments from Germany. The current focus areas of the bilateral cooperation are water management, renewable energies, energy efficiency and climate change. The Regional Center for Renewable Energy and Energy Efficiency (RCREEE), based in Cairo. Besides Egypt, other Arab members of the RCREEE are Algeria, Bahrain, Djibouti, Egypt, Iraq, Jordan, Kuwait, Lebanon, Libya, Mauritania, Morocco, Palestine, Sudan, Syria, Tunisia and Yemen. RCREEE formulates and disseminates policies in support of RE and EE in the region and provides a platform for the regional exchange on policy issues and technological questions. In addition, RCREEE encourages the participation of the private sector to promote the establishment of a regional RE and EE industry. The Egyptian-German High-Level Committee on Renewable Energy, Energy Efficiency and Environmental Protection JCEE, is a bilateral Egyptian-German initiative. The JCEE is a platform for energy policy discussion, for developing initiatives for investment as well as institutional projects, awareness, and capacity building activities and establishing contacts and exchange between the two countries. The project is financed by the Egyptian Ministry of Electricity and Energy and the German Federal Ministry of Economic Cooperation and Development (BMZ). The implementing partners of the cooperation are NREA and GIZ. This page was last modified on 7 March 2019, at 16:54. This page has been accessed 225,807 times.